Fourteen (14) Asian items. 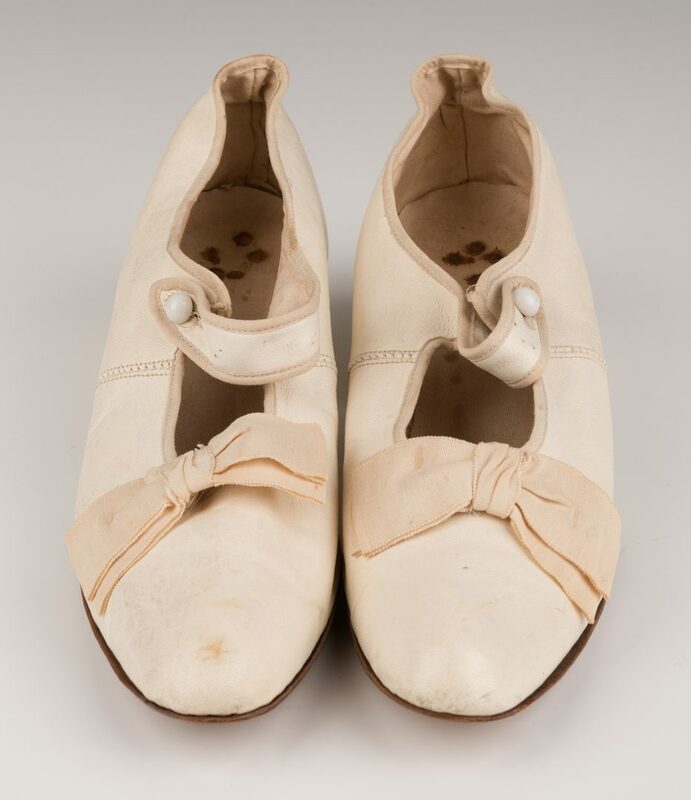 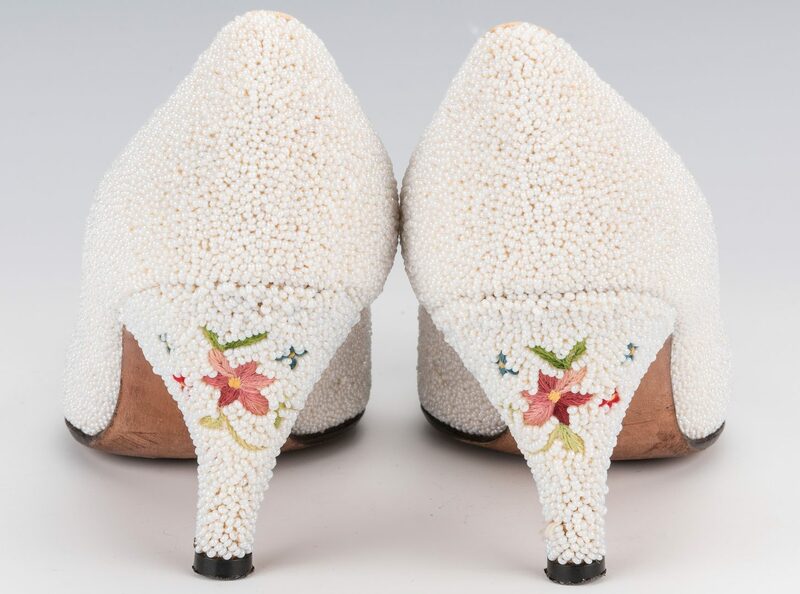 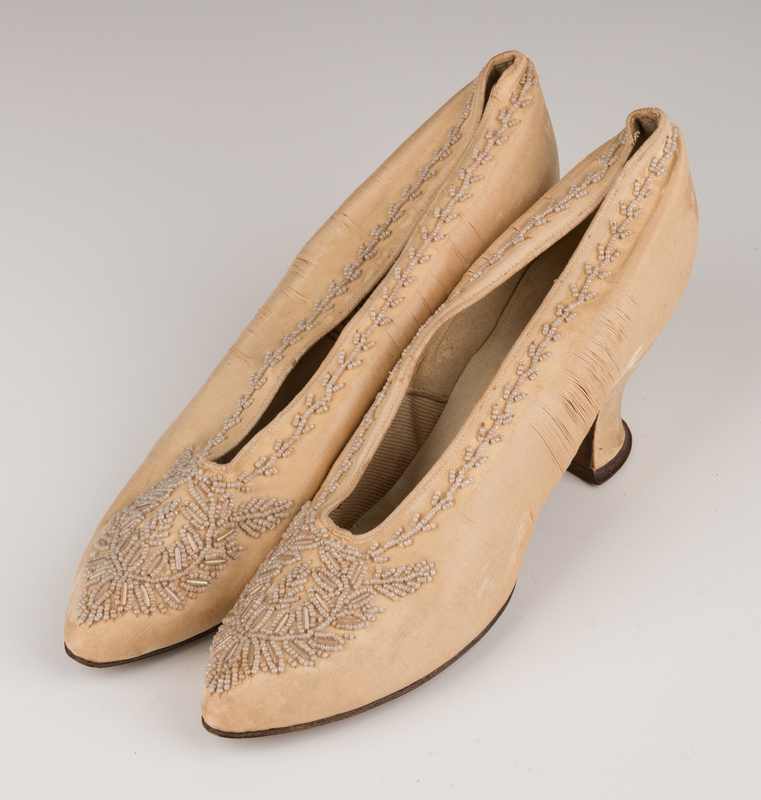 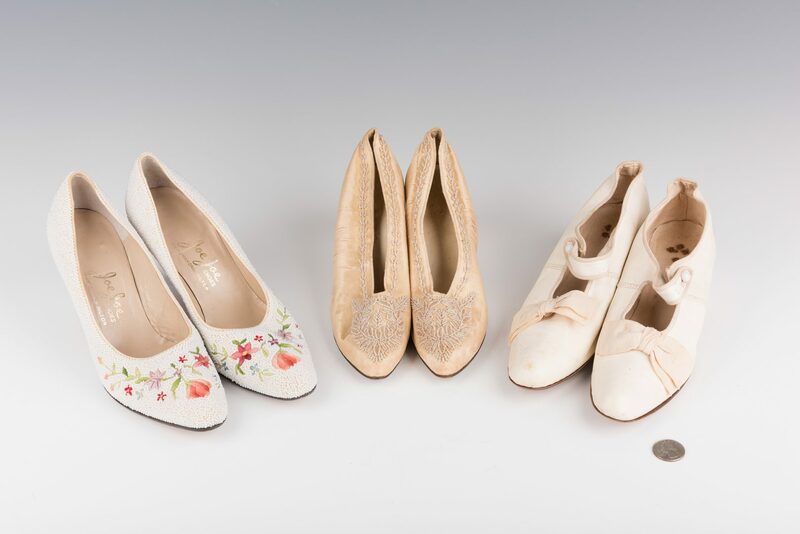 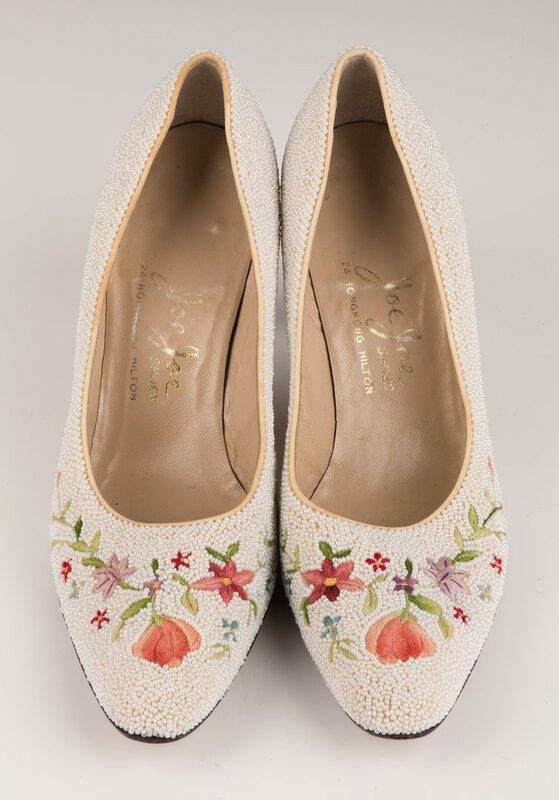 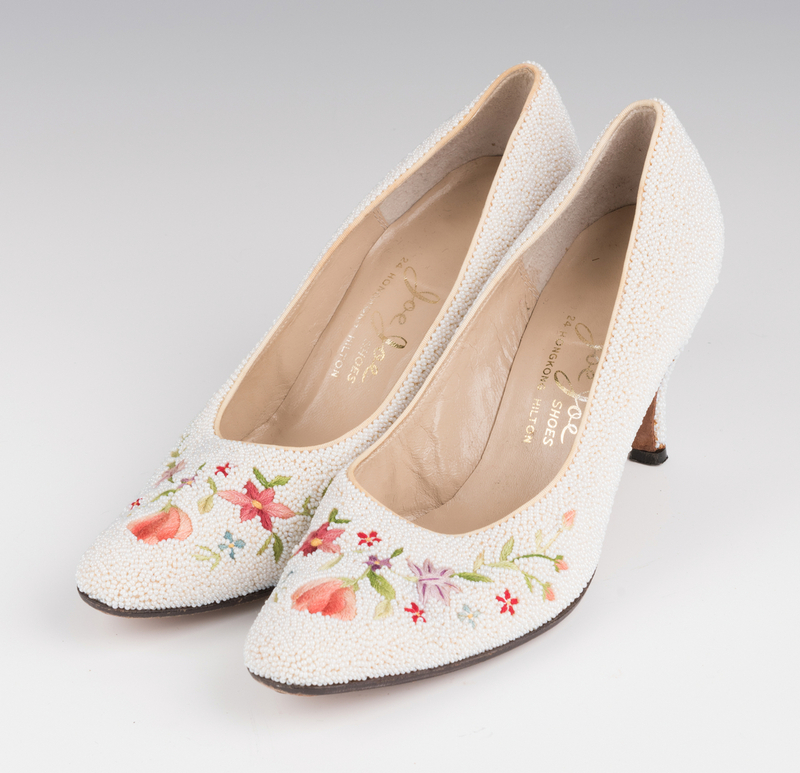 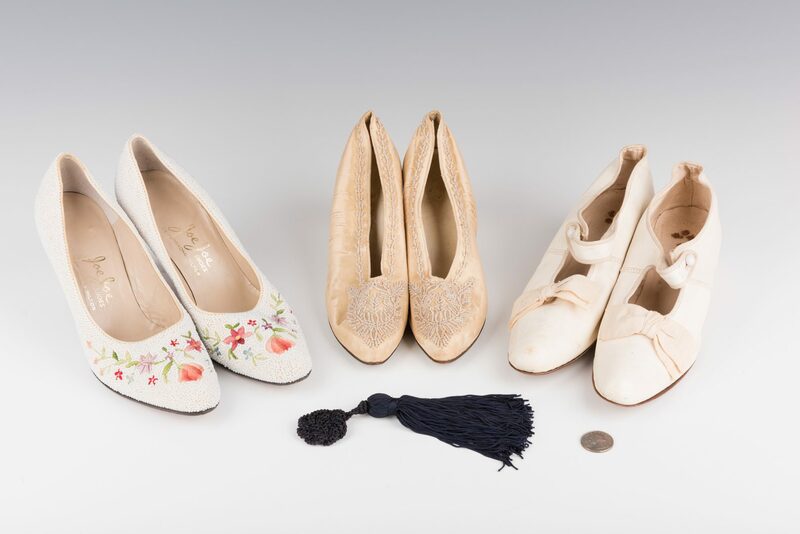 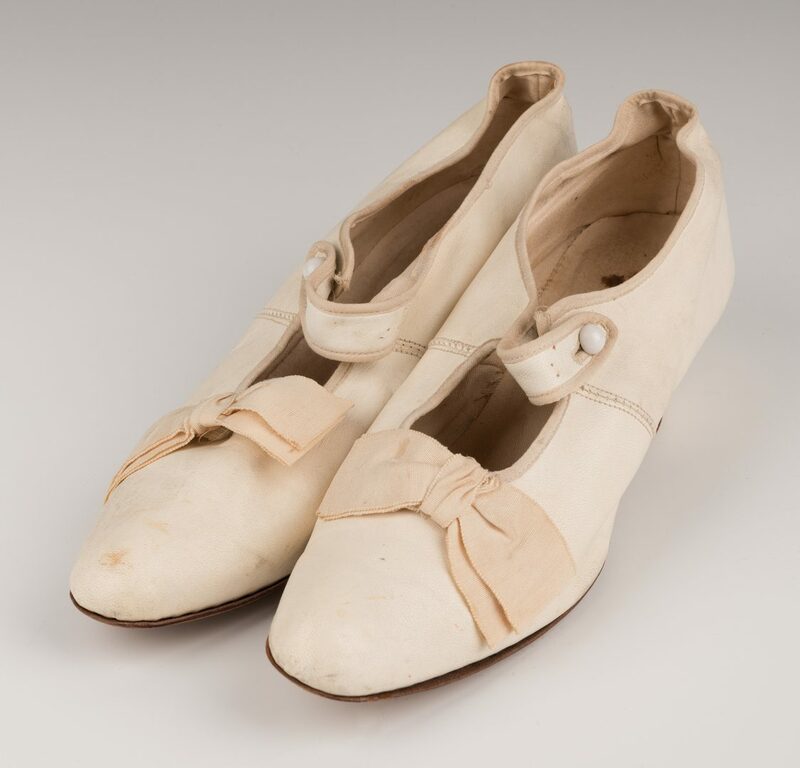 1st-3rd items: Three (3) pairs of Vintage Shoes including a white beaded and embroidered pair of pumps labeled Joe Joe Shoes (Hong Kong Hilton), an ivory pair of silk beaded pumps with kitten heels labled D.H. Holmes Co. (New Orleans) and a white leather pair of Mary Janes with satin bows. 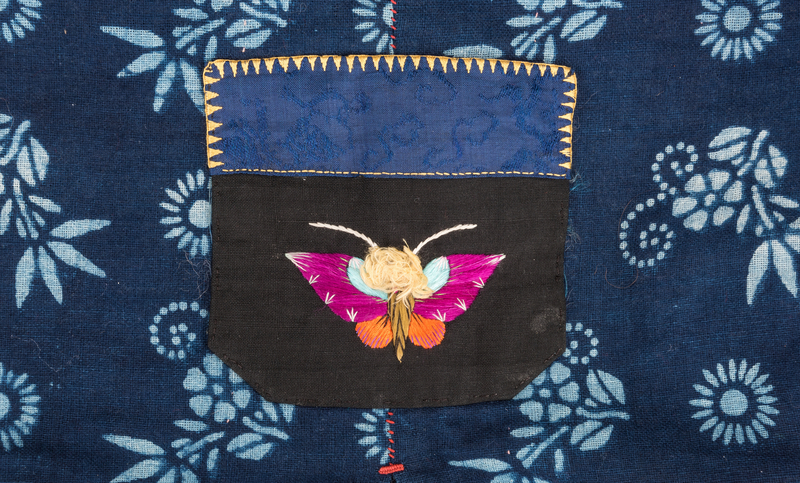 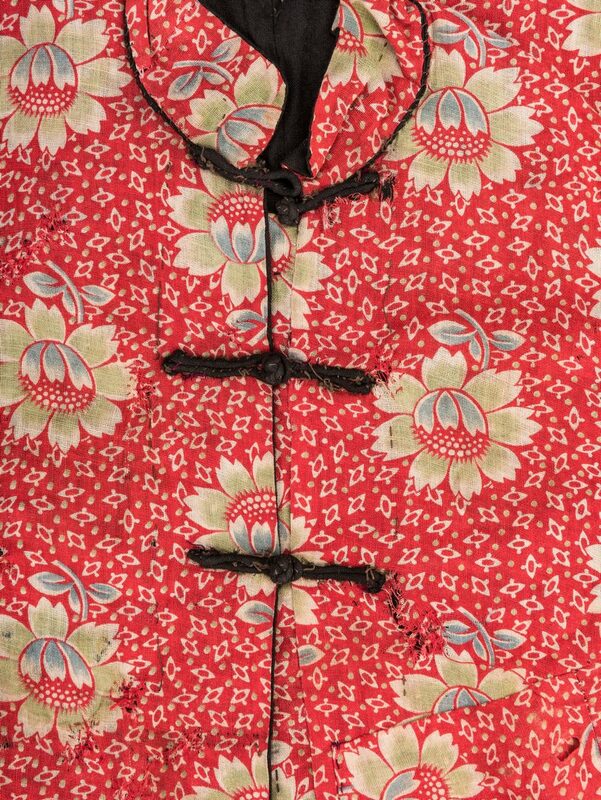 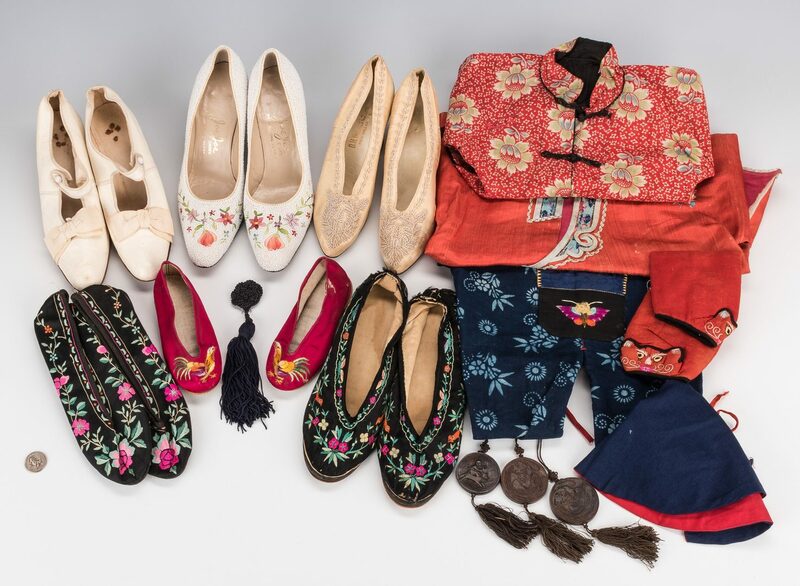 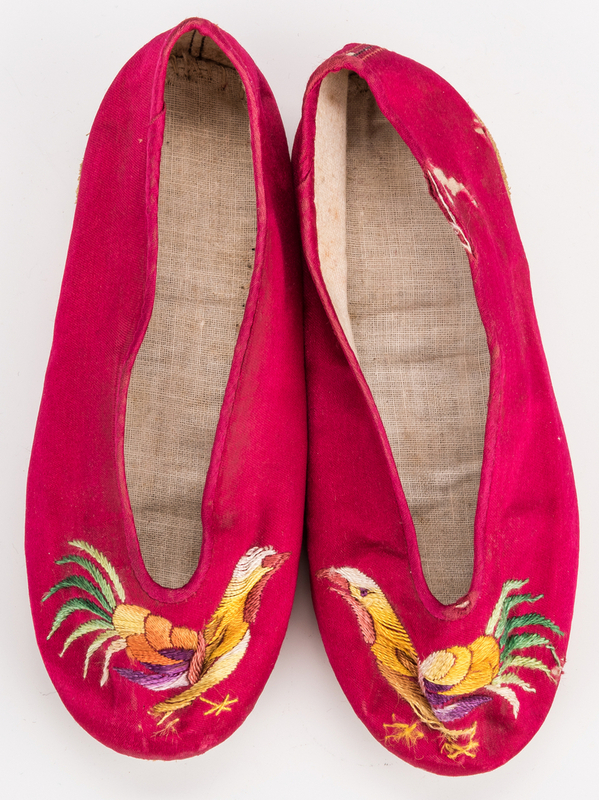 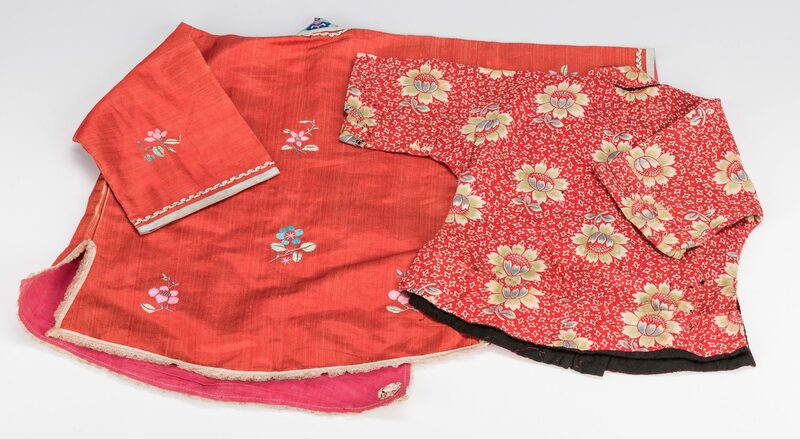 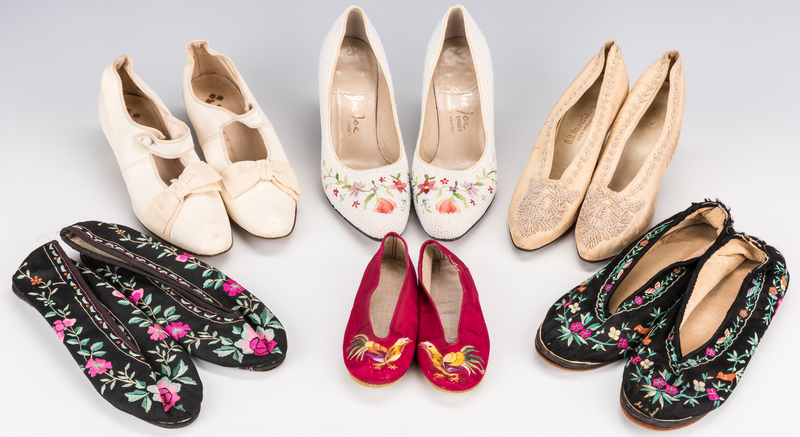 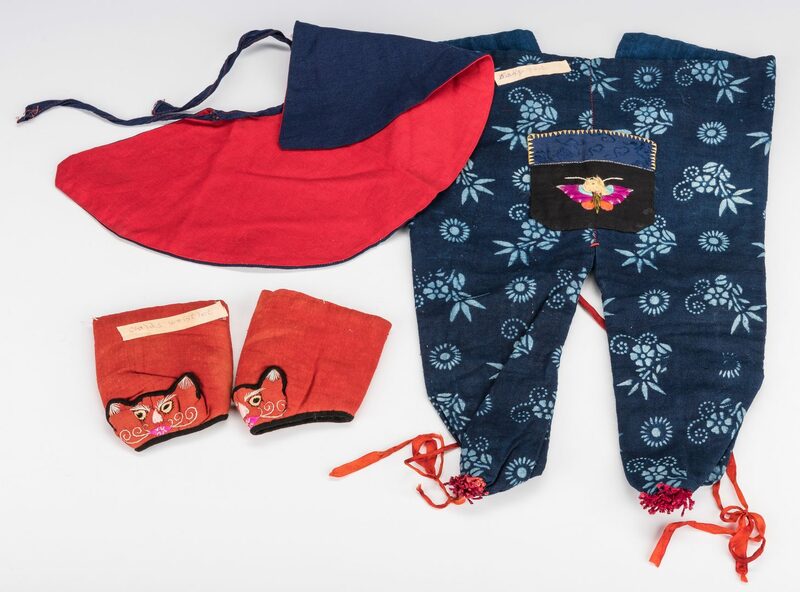 4th-11th items: Eight (8) Chinese clothing items including a pair of child's pink shoes, 2 pairs of black embroidered women's shoes, child's red robe, blue baby's pants, red and blue baby's collar, baby's red floral robe, and pair of child's embroidered wristlets. 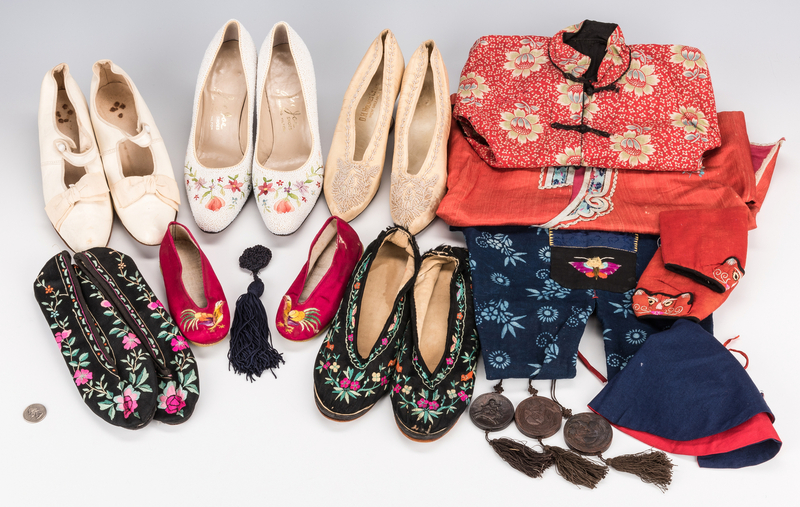 All items 20th century. 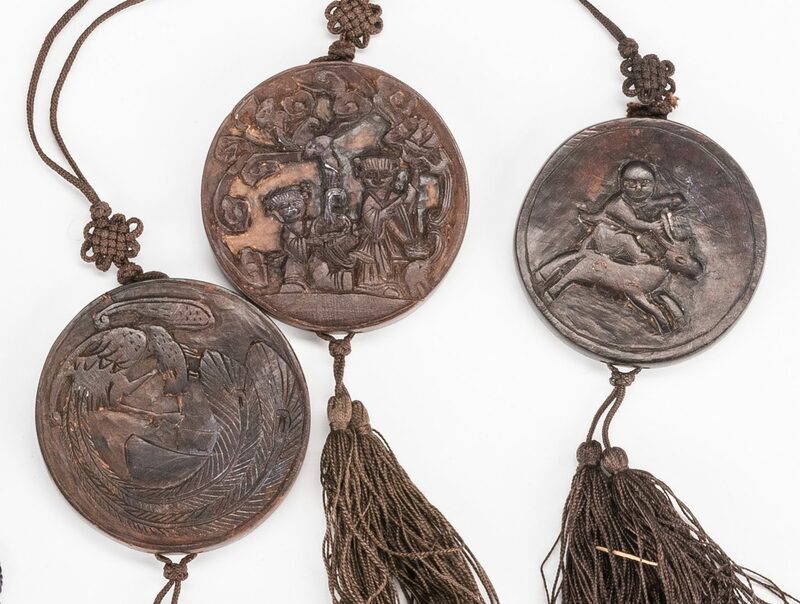 12th-14th items: Three (3) Chinese carved wooden pendants, strung as necklaces, one (1) carved with bat, longevity symbol and figure atop a deer decoration (1 3/4" dia.) 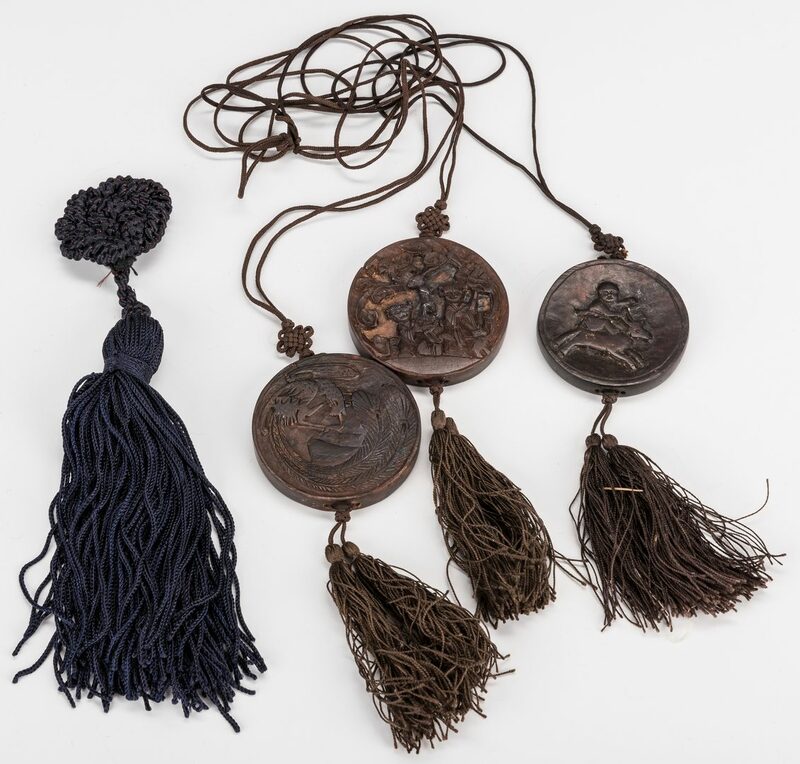 and two (2) carved with figures holding lingzhi and phoenix decoration (2" dia.). 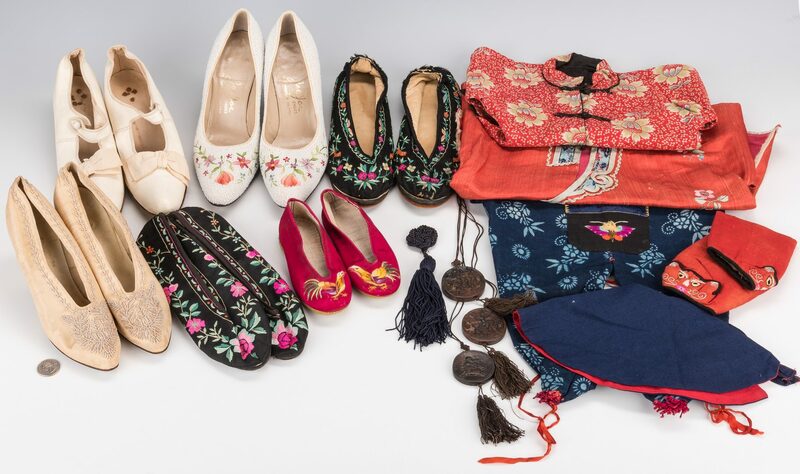 All items early 20th century. 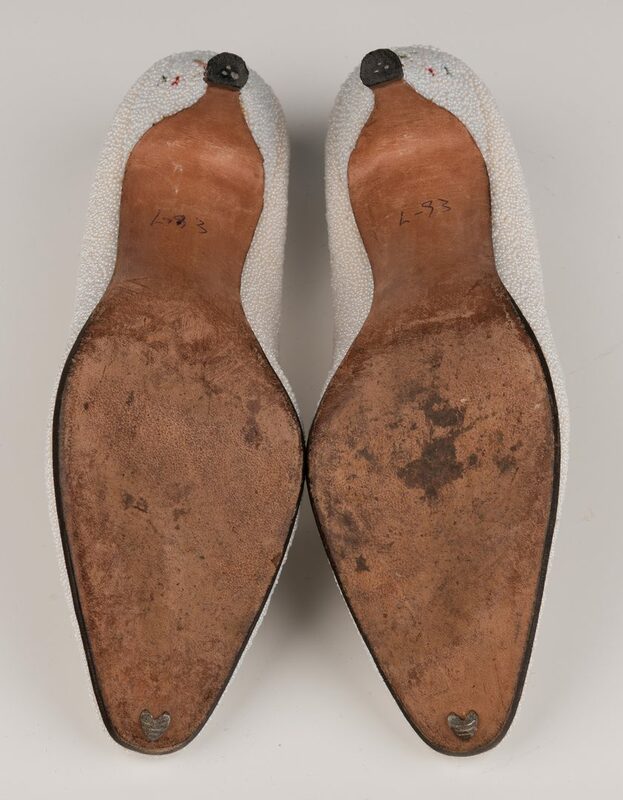 CONDITION: 1st pair: Very good condition with minor wrinkling interior, small area of bead loss right mate at heel point. 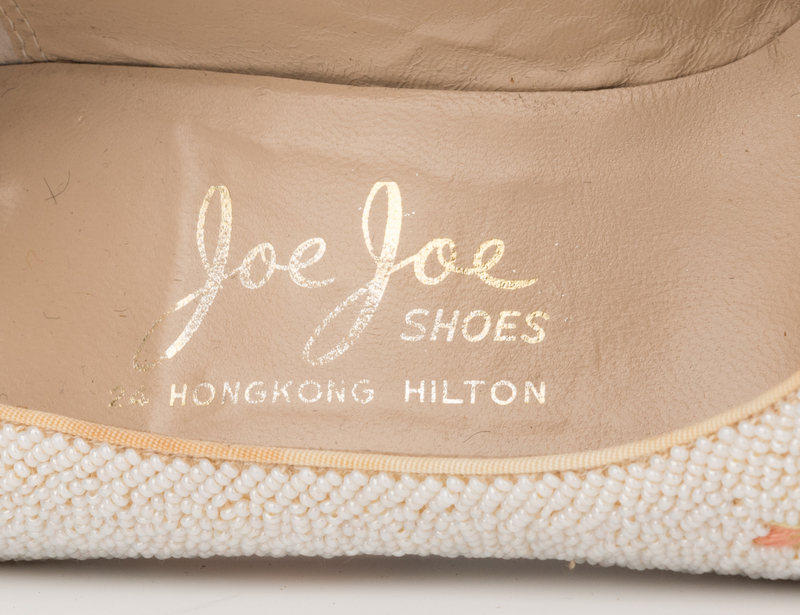 Soles mild wear. 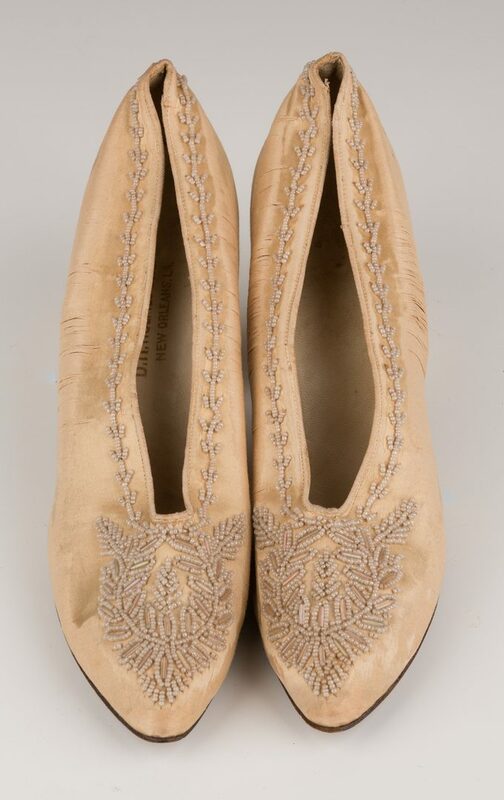 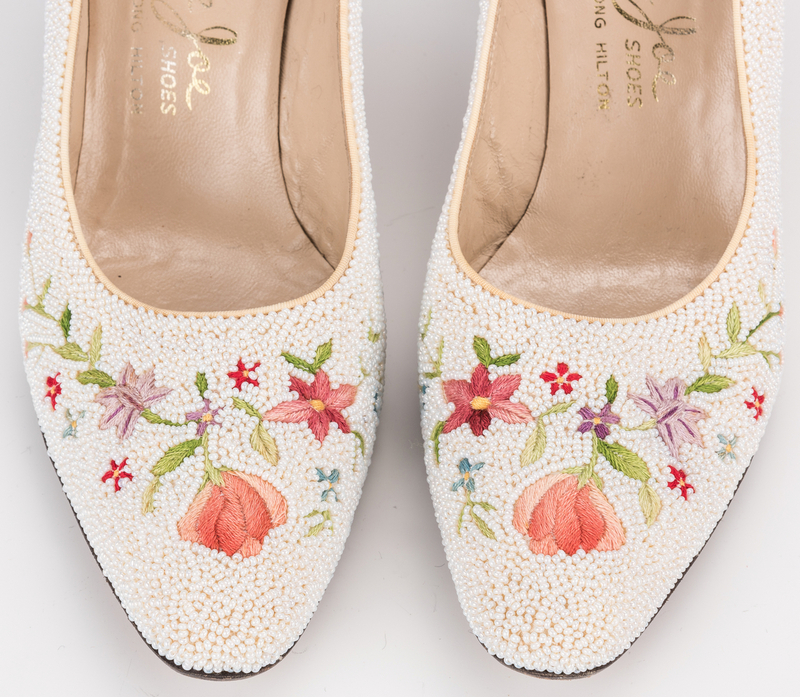 2nd pair: Moderate to heavy wear, but bead work remains intact. 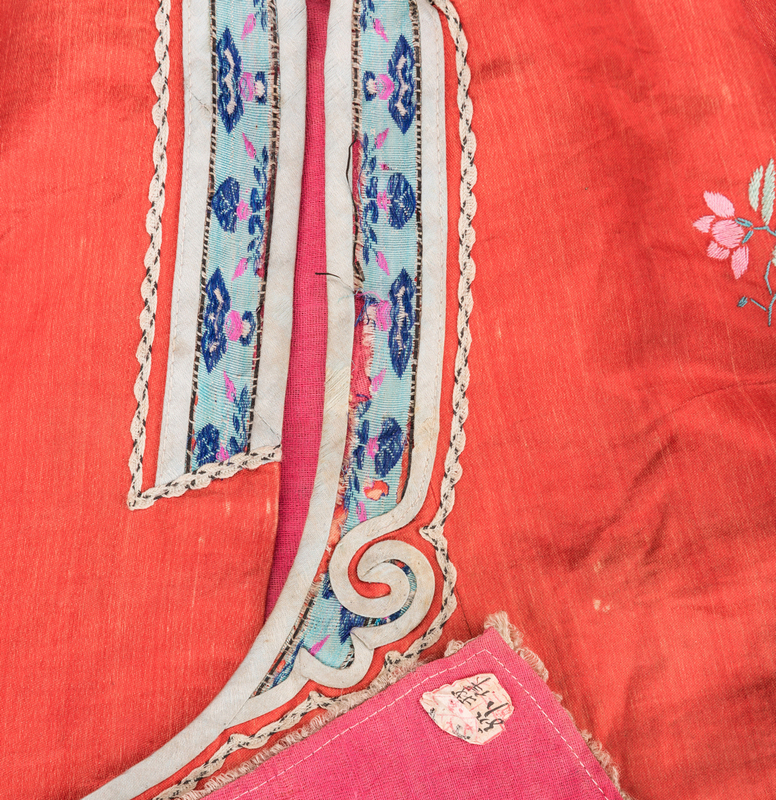 Silk has several areas of unidirectional loss to weft and wear abrasions. Soles worn, interiors with moderate wear. 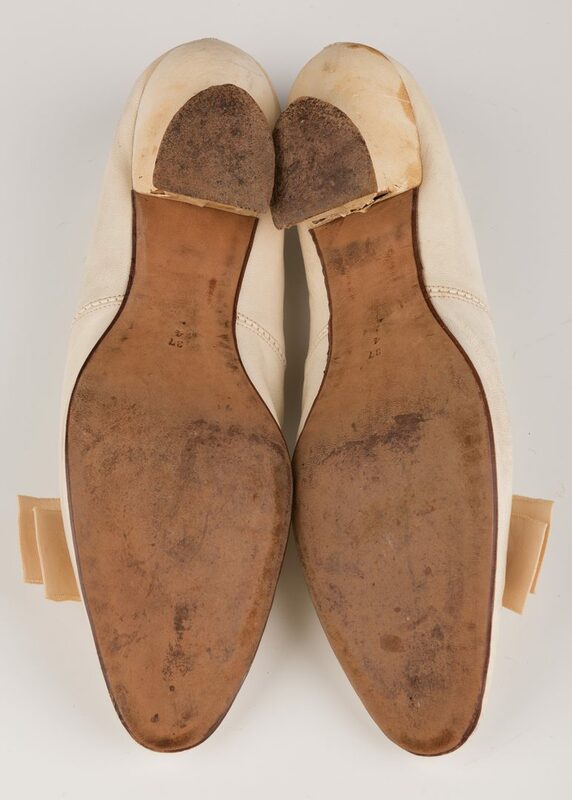 3rd pair: Moderate wear with soiling and oxidation stains. 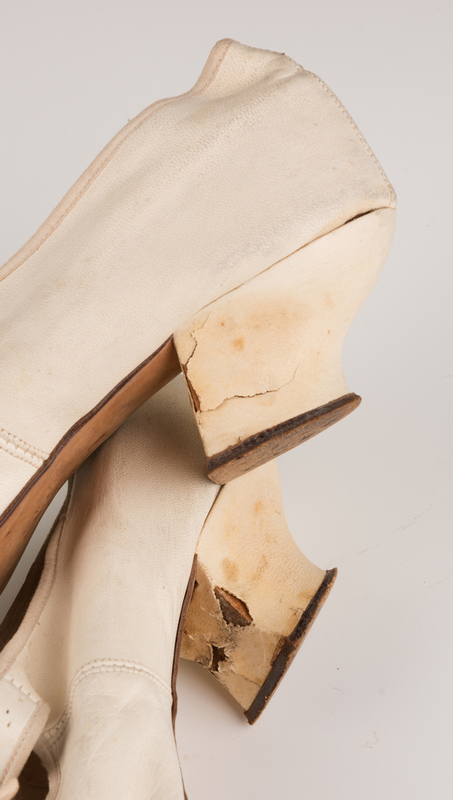 Heel covers with wear and loss. 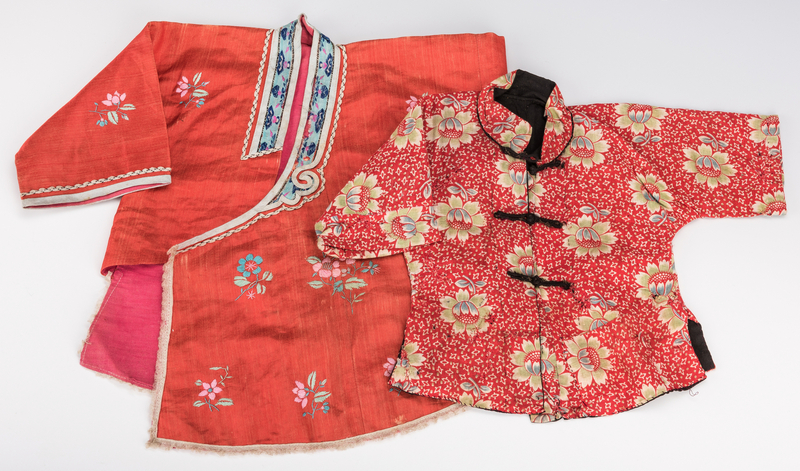 Chinese clothing items with general wear comensurate with use. 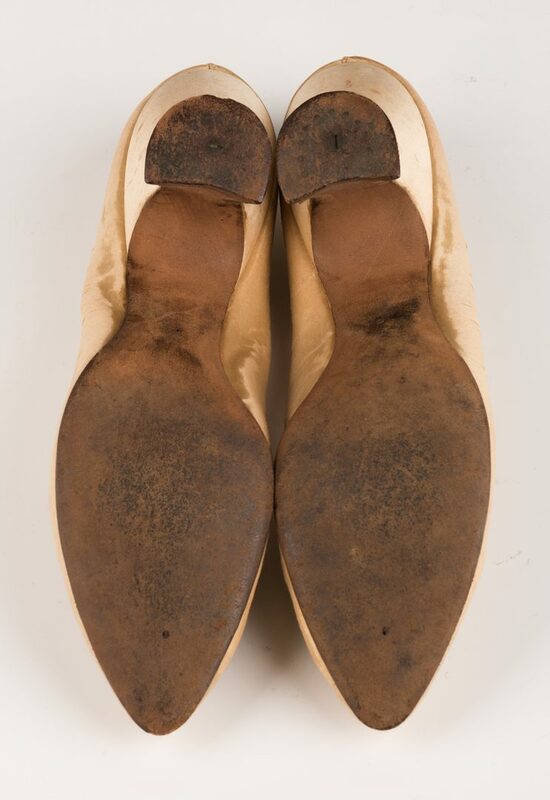 Some losses to one black shoe in the heel area. Losses and patches to floral red robe. 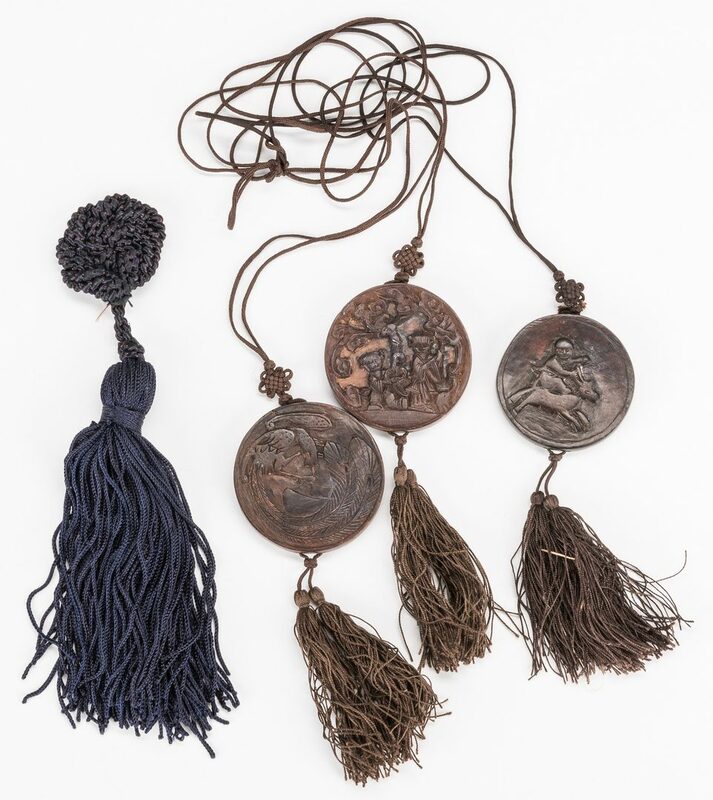 Pendants: All overall good condition, moderate wear to bat pendant.